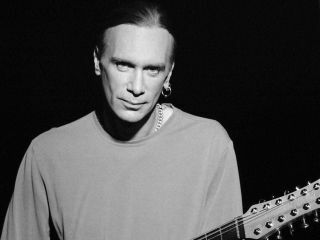 Renowned bassist Billy Sheehan tells MusicRadar that the original lineup of Mr. Big will reunite for a June tour of Japan. "We got together last fall" says Sheehan. "It was just one of those things, the timing was right. We played a gig at the House Of Blues in LA and we smoked the joint. Afterwards, we all kind of looked at one another and were like, 'OK, that was cool...Now what?" That 'now what?' will soon entail an extensive tour of Japan, which the band will officially announce at a press conference in that country next week. But as huge as the original lineup Mr Big were in the far east (and they were very 'big,' pardon the pun) Sheehan insists a cash-cow nostalgia tour was never the plan. "The way I look at it is, it's like getting back with an old girlfriend," says Sheehan. "But because you want to, not because you have to. All of us are doing fine in our solo careers. This is something that felt right, and after that one gig we were like, 'We should do more of these. This was fun!'" Fun was something that was lacking in Mr Big when guitarist Paul Gilbert left the group (which also included singer Eric Martin and drummer Pat Torpey) in the late '90s. He was replaced by guitarist Richie Kotzen, whom Sheehan describes as an "awesome musician and a dear friend." Still, in Sheehan's view, the chemistry in the band was never the same after Gilbert's departure. "It's like The Three Stooges or something," he says. "One guy leaves, another comes in, it might still be good, but it's never the same. That's the way it was after Paul left. Everybody felt a void." "Why we broke big in Japan is one of those things you can't even begin to figure out. It was just meant to happen"
While Mr Big achieved significant success on both sides of the Atlantic during the days of hair metal ("such a bizarre term for a bizarre time," says Sheehan), they were viewed as kings in Japan, receiving the kind of treatment once granted The Beatles and, a decade later, KISS. In turn, Mr Big churned out albums such as Japanemonium and Live At Budokan. They even wrote a song called I Love You Japan. Talk about giving back to your fans. "Why we broke big in Japan is one of those things you can't even begin to figure out," says Sheehan. "It was just meant to happen." Even so, the bassist stresses that their decision to stage their reunion shows has nothing to do banking serious yen. "Us going to Japan to plan is more about being in a place that's comfortable, and being around fans who will be good to us," says Sheehan. "And maybe they'll give us some constructive criticism too, who knows? But it's not about making money. Believe me, we could've done this ten years ago if that's was all we were after." That said, the fact that this is now the 20th anniversary of Mr Big's formation doesn't escape Sheehan. "I know how it looks," he says. "Band gets together after 20 years to cash in. It's like Spinal Tap or something. "But trust me, we're in this to play and have a good time. When you consider the amount of rehearsals you have to have with a band, how much time you have to spend together, how many hours you have to sit on planes and backstage and whatever, there's no amount of money that can make it worthwhile unless you really want to do it." As for the animosity that tore the original lineup apart, Sheehan laughs and says, "You know what? I can't honestly remember who was mad at who. That's the great thing about getting older: you forget the bad times and remember the good times. And hopefully, this band will have a lot more of the latter."